Prognostically significant risk factors in patients with portal cholangiocarcinoma (Klatskin tumor) defining the longterm results of surgical treatment were identified. 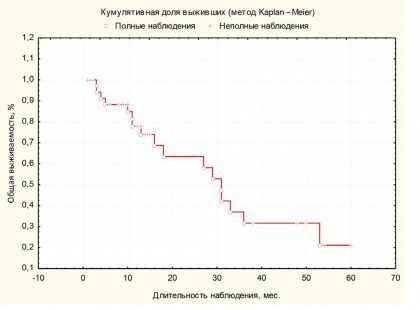 Survival analysis showed that general 1-, 3- and 5-year survival rate of 77.9 %, 31.7 %, 21.1 %, respectively, was achieved. Subsequent multivariate Cox regression analysis showed that the degree of differentiation of tumor cells and resection of the caudate lobe of the liver are significantly affecting the prognosis of the disease. In the study of the molecular tumor markers we revealed that there is a moderate correlation (p=0,032) between the expression of molecular marker N-cadherin and overall survival.